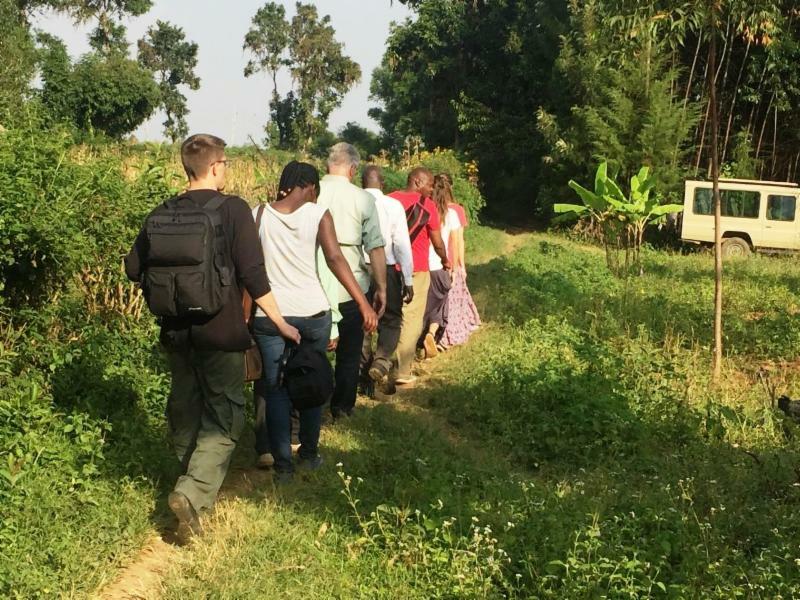 NR Team Return from Successful Trip to Kenya! 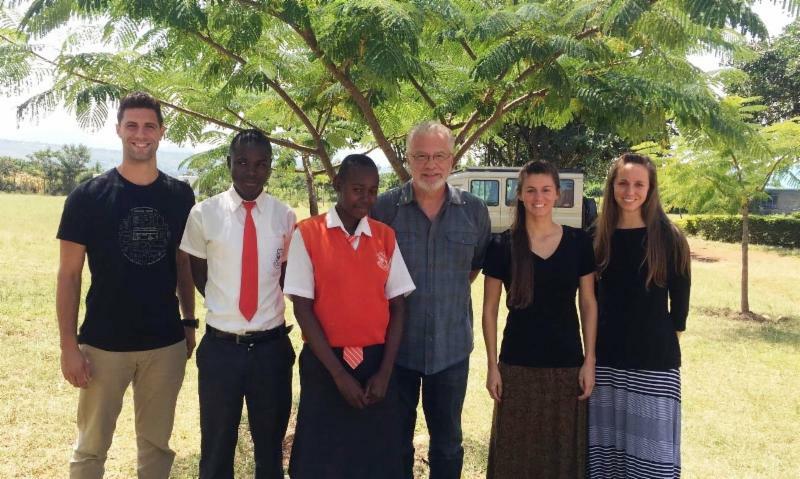 NR President and Directors Return from Kenya! 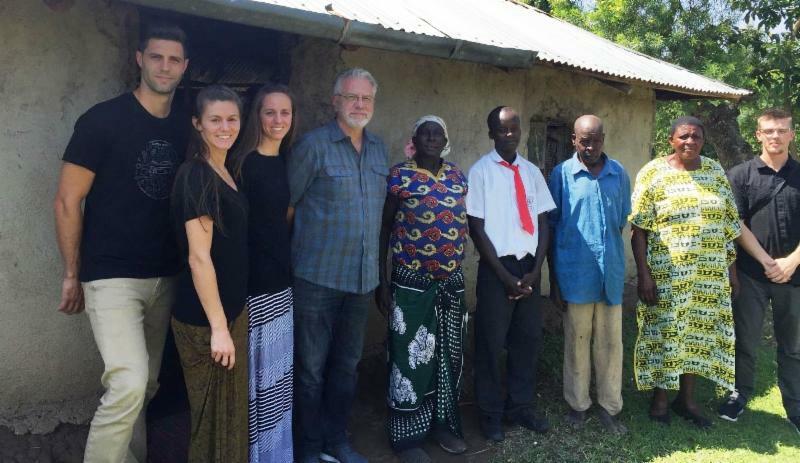 Our President Rob Bollinger and Directors returned home from an historic trip to Kenya at the end of July. This was their first administrative trip together since Rev. Nick Bollinger, Ms Robbie Bollinger, PA-C and Ms Rachel Bollinger, MFT-C became Directors of Nehemiah's Restoration a number of months ago. Though they achieved much while there; as expected, they came home with much, much more to strategize for the future! Their main activities while there are summed up as followed! Introduction of new NR Directors to the local authorities: Rev Nick Bollinger, Director of Spiritual Development; Ms. Robbie Bollinger PA-C, Director of Medical Health Services; and Ms. Rachel Bollinger, MFT-C, Director of Mental Health Services. NR President Rob Bollinger and NR Directors with Orphan and Vulnerable Children (OVC)s George Okore and Juliet Akinyi who are sponsor children who have been given secondary school educational support. This picture was taken at Gombe Kokulo Secondary School when they visited them to check in on their educational progress. Both are doing exceptionally well in their prospective classes. Juliet is top ranking in her class and is a leader of the Young Women's Christian Group in her school. George is doing exceptional well with his grades. We are very proud of the both of them. Our team conducted In-Home visits for the purpose of assessing living standards of the OVCs in our program and for those not in our program. The majority of the OVCs not in our program have no bedding (so they sleep on the ground), they lack clothing and the furniture in their homes are often broken or non existent. 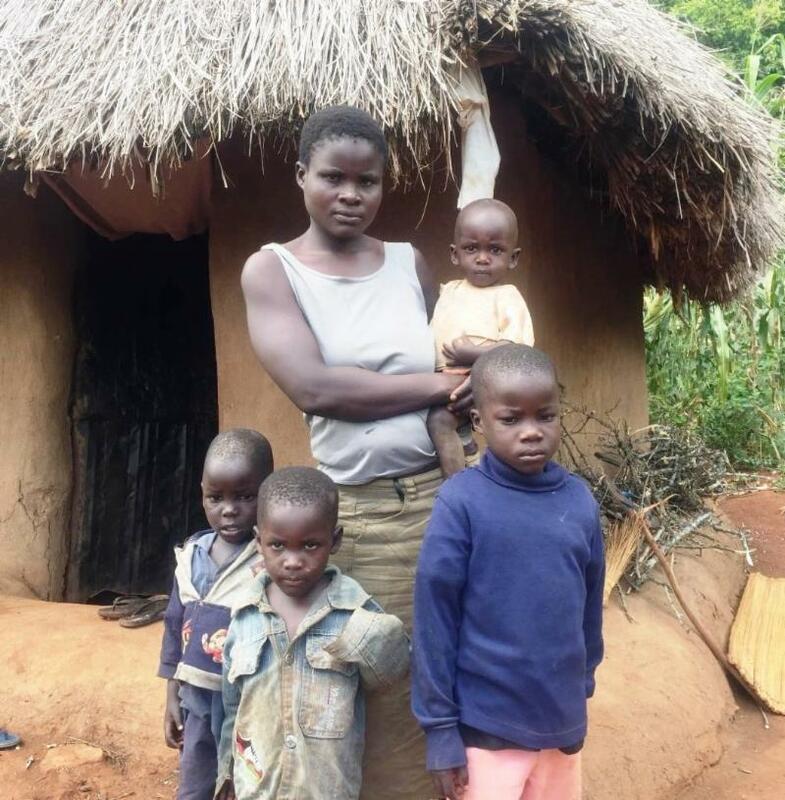 During an In-Home Living and Health Assessment a young man by the name of Kennedy (center) was found to have lost both his parents due to HIV and AIDS and is considered a total orphan. He is being raised and supported solely by his only living relatives, which are his grandparents. 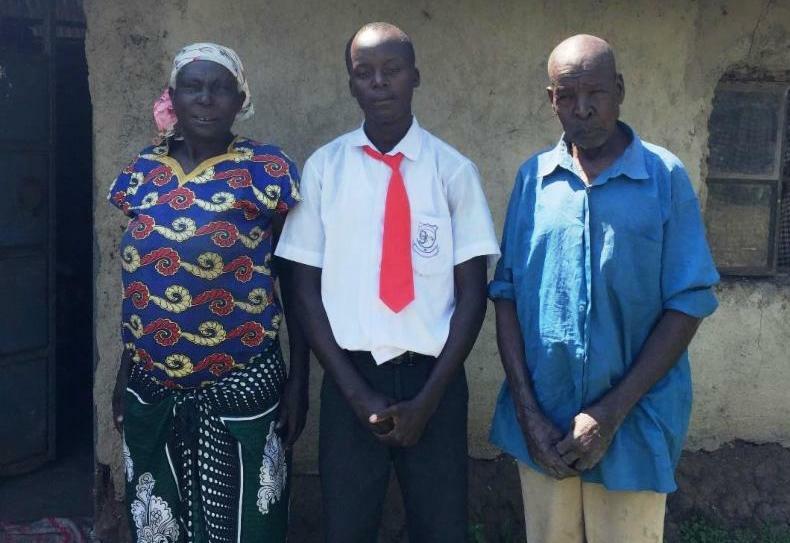 NR’s Team, Rael Omollo, (Kisumu Boarder Center Coordinator) (second, right) are shown here with Kennedy and his grandparents in front of their home. Our team was told by Kennedy's grandparents they have little to provide for Kennedy, but they are committed to do everything possible to get him through school. An Orphan & Vulnerable Children (OVC) On-The-Rise! 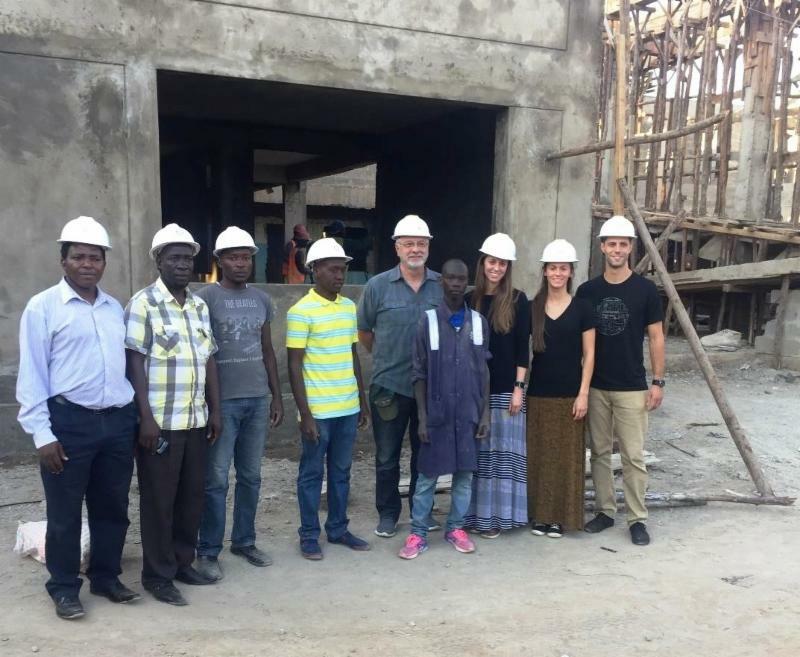 Our team visited an older OVC by the name of Steven Owino (not wearing a hardhat) who is pursuing Electrical Engineering through our vocational training program. We found Steven at a construction worksite where the federal government is currently building a hospital. (NR team at the right and Nazarene Compassionate Organization (NCO), Coordinator Rev. Samuel Oketch at far left) Steven is currently a journeyman pulling wires and setting outlet boxes in the building. Someday soon, Steven will be able to earn an income that will provide for his family. Women of The Program On-The-Rise! One of our projects is supporting a group of young women who are infected/affected with HIV and AIDS at Kisumu Border Center. Here we are providing vocational training in tailoring and dressmaking as an income earning trade. 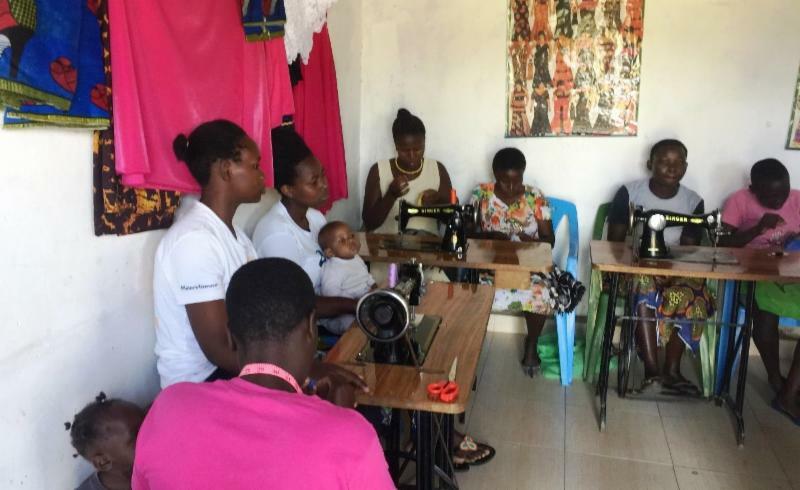 Funding from our program has provided the sewing machines and start up cost for materials. Volunteers at the Center are helping to train these young women. 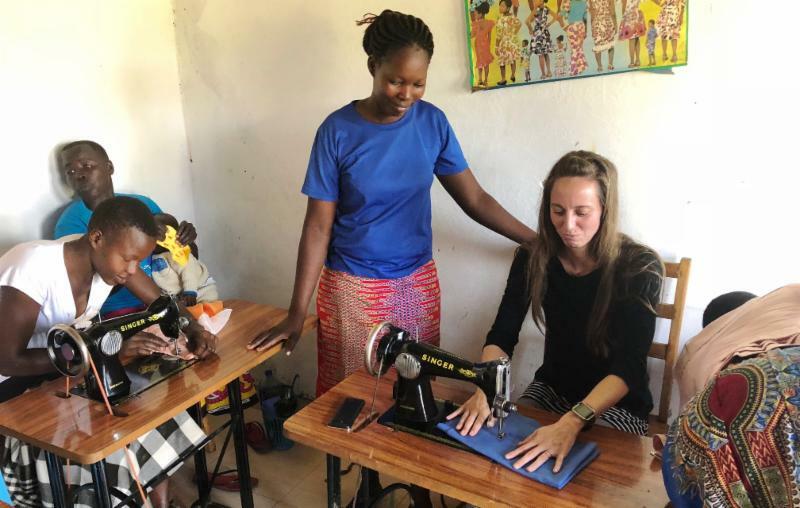 Director of Medical Health Services, Robbie Bollinger, PA-C, is being given some pointers in sewing by the Kisumu Border Center instructor. We all have a lot to learn! 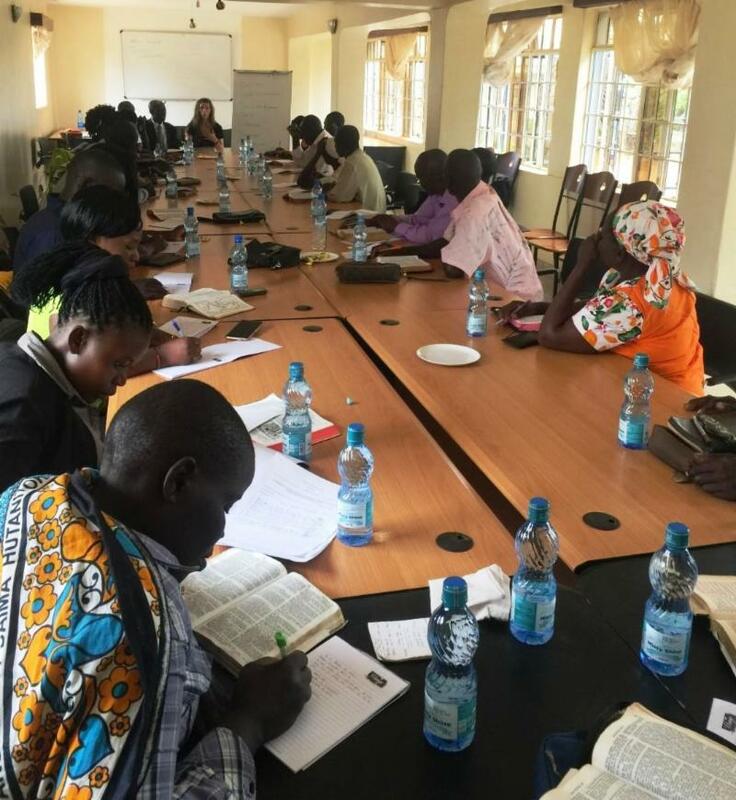 Three different training courses, at all three Centers (Kisumu Border, Siaya Center and Bondo Center), were provided by each of our Directors in How to Be an Authentic Church, by Rev. Nick Bollinger; Basic Nutrition/Sanitation/Health, by Ms Robbie Bollinger, PA-C; and Basics of Conflict Resolution, by Ms Rachel Bollinger, MFT-C. Participants at each Center were church & community leaders, caregivers, social workers, volunteers, and government representatives at the local level. Rev. Nick Bollinger is shown (above) performing church training for the group of 35. 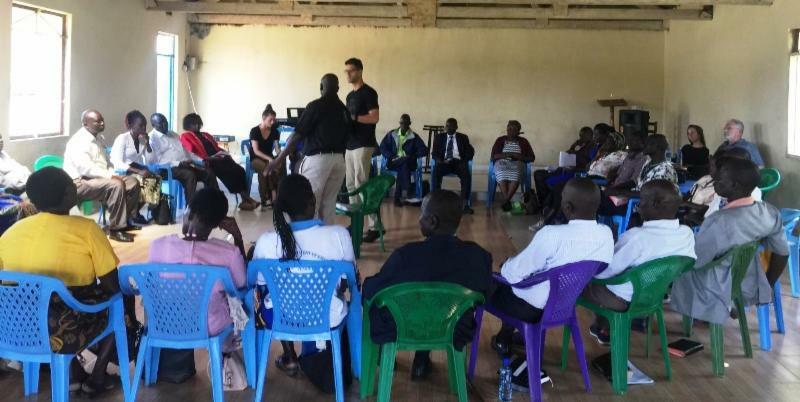 Ms. Rachel Bollinger, MFT-C is shown (at right) performing Conflict Resolution Training with a biblical reference and how to assimilate orphaned children into a new home of a caregiver for the Bondo Center. 30 people attended here. 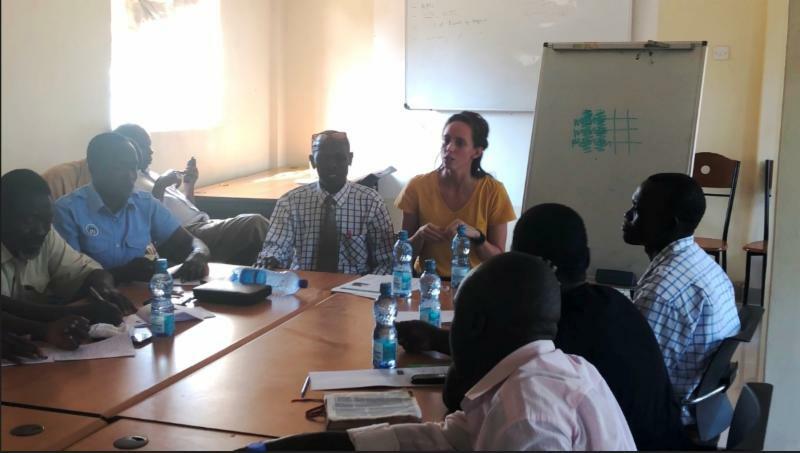 Ms. Robbie Bollinger, PA-C is shown (at right) performing water sanitation training for the Bondo Center. 30 people attended here. Our team made a courtesy visit to the Local Area Chief Barrack Opondo (center) at his office in Sirembe Center. 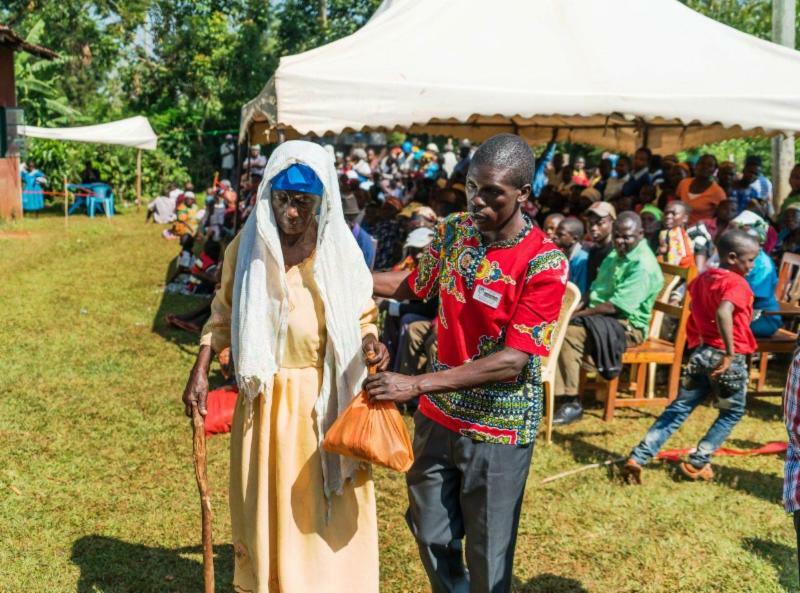 They learned from the Chief about the need in areas of community food grain bank, lack of enough drugs in the local health centers, and lack of enough health facilities like latrines in local schools and community market centers. 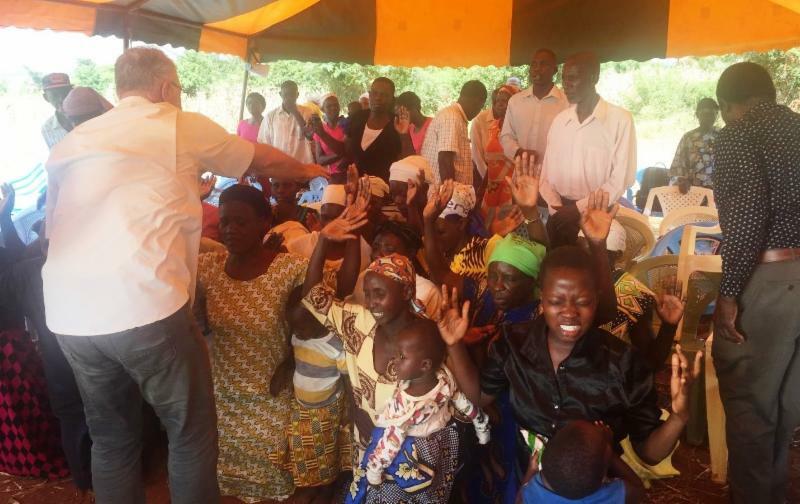 While in Kenya our team visited with Apape Project International during a Medical Camp. API has been providing these camps for over 10 years and they were gracious enough to let us visit and assess their process to assist us in developing our own medical camps in the future. Big thanks to Gary and Lesley Scherer, Directors of API for hosting us. Seen here are Ms. Rachel Bollinger, MFT-C, Director of Mental Health Services (left); Rob Bollinger, NR Founder and President (second, left); Rev. Nick Bollinger, Director of Spiritual Development (second right); Ms. Robbie Bollinger, PA-C, Director of Medical Health Services (far right). 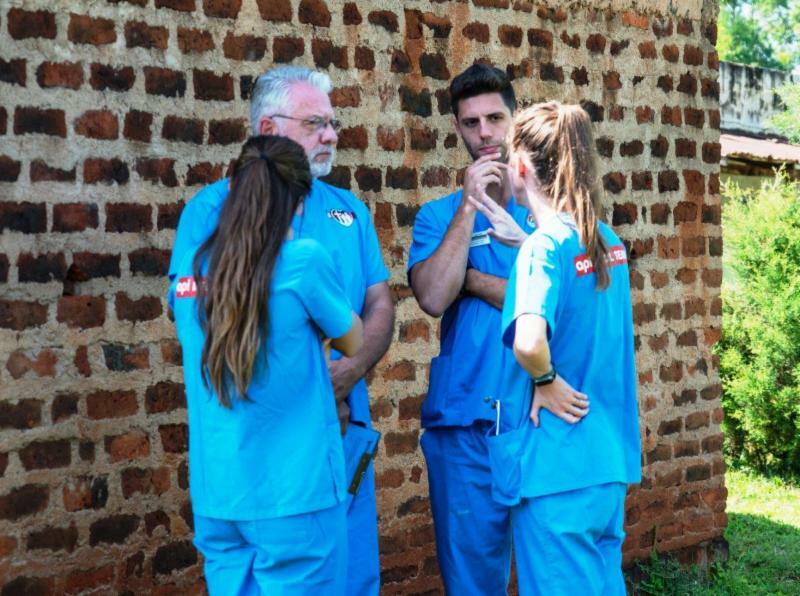 NR team is discussing the Agape Project International Medical Camp process and procedures before engaging with local people. Over 500 people came to the five day Medical Camp organized by Agape Project International. Many of them weak from their illness. This woman brought a few items from her garden for payment, though the services were all free. 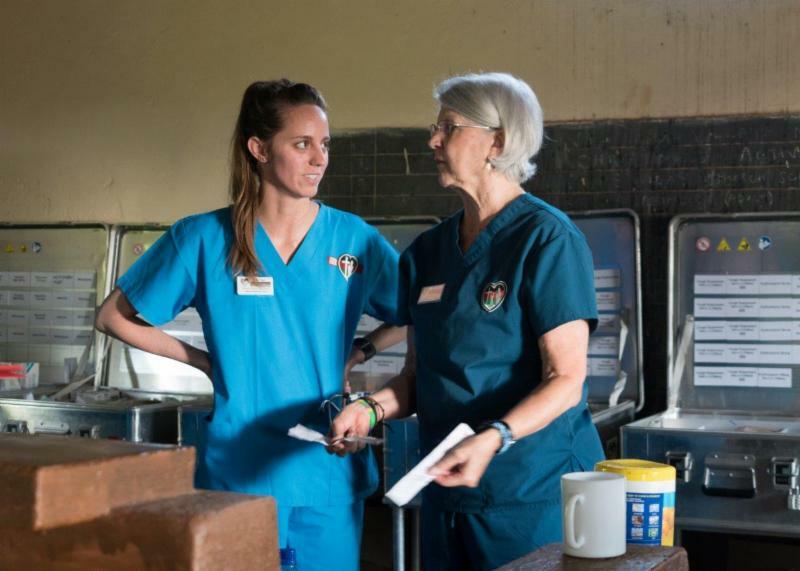 Ms. Robbie Bollinger, PA-C, Director of Medical Health Services (left) and Lesley Scherer, API Director (right), engaging in Agape Project International Medical Camp pharmaceutical process. Build-a-Home No. 12 was built in February of 2018 and was dedicated by our Directors and Founder and President during this trip. Our beneficiary Benta Atieno Odhiambo, is shown in the middle holding a picture of her sponsors the Guildner Family. With her are her three OVCs that live with her. Since the initial construction of her home, Benta has placed a second coat of mud on the walls and is waiting for the rainy season to pass before applying a final coat of mud, mixed with cow dung. She was praising the Lord for being warm and dry this past rainy season. From right: Rev. Michael Oketch, Rev. 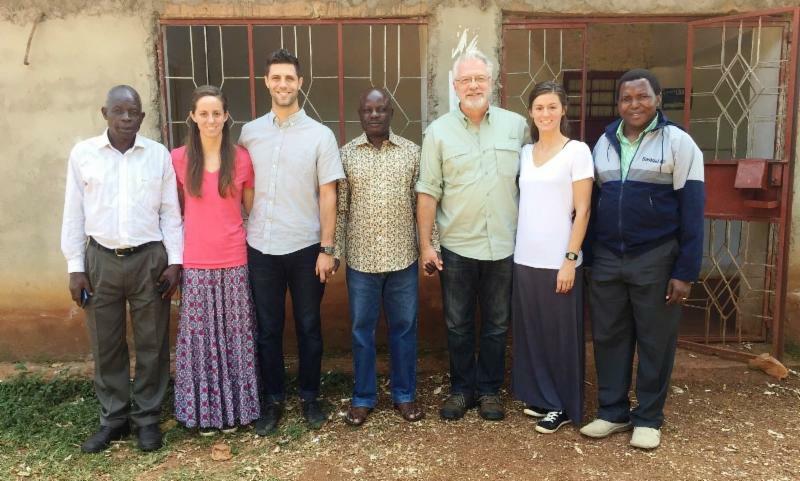 Nick Bollinger, Rachel Bollinger - MFT-C, Retire Pastor Rob Bollinger, Maurice Miyayi (Siaya Center Coordinator), and Peter Otieno (Assistant pastor at Ulumba CotN). Caregivers at Ugolwe Center demonstrated their ‘Push and Pull Project' supported by Nehemiah's Restoration. It is a technology in which Desmodium (a local vegetation) is planted in between the corn crops and grass is planted around the edge of the plot. Insects that destroy the corp are pulled on to the plot by the Desmodium and later pushed to the edge of the plot by the scent it produces. When the insects land on the grass they die as a result of acid being produced by the grass. The technology also kills certain weeds that hinder growth of corn. 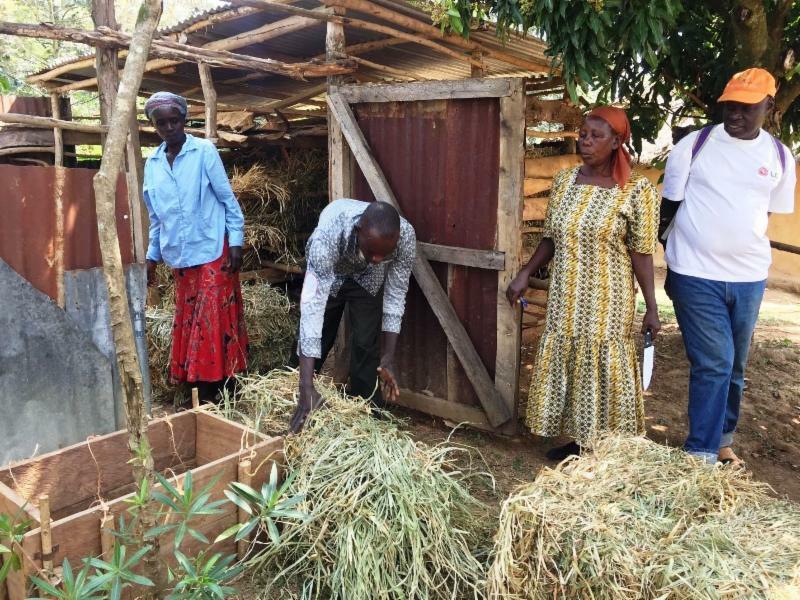 After the corn crop is harvested the group harvests and sells the grass for animal feed as shown in the picture above at 400 Kshs ($4 USD) per bail and all the proceeds go towards supporting their OVCs. In a single month they can sell between 60-100 bails, yielding up to $40,000 Kshs or ($400 USD) per month. They also use corn both for their personal consumption and for sale. Our team (Rev. Nick Bollinger shown here at center) and local volunteers pitched in to place the first coat of mud on the house. 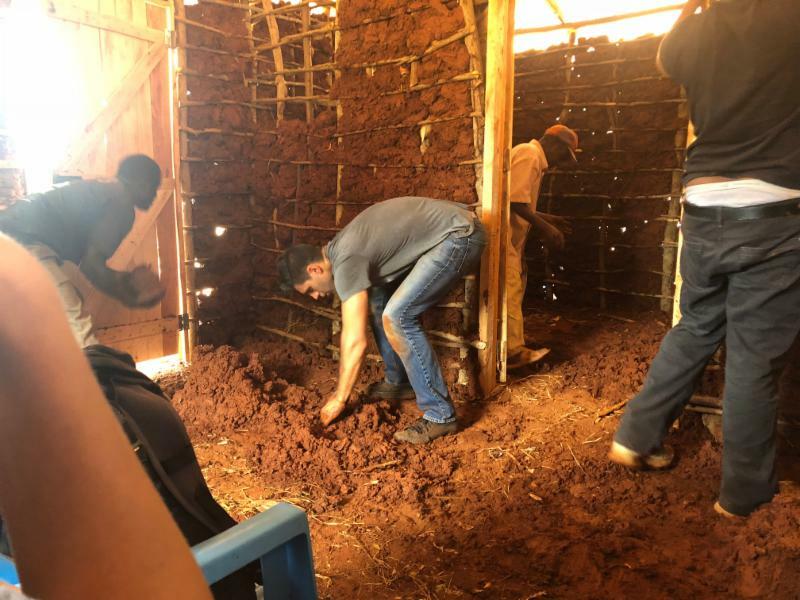 Later a second coat of mud and a final dung mixture coat will be placed on the home by the home's recipient (Celine). At the Build-A-Home dedication service, Retired Pastor Rob Bollinger, Founder and President of NR reached out to community members who came forward for prayers after he preached. A number of them rededicating their lives to God. First phase of mud completed with metal roof on Build-a-Home No. 13. 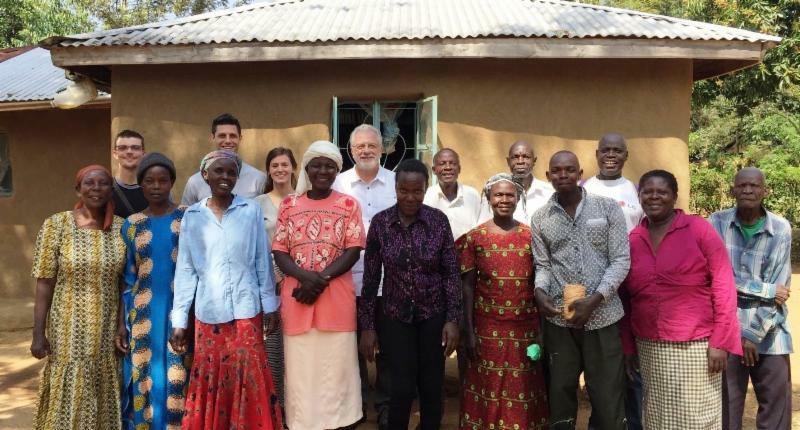 Beneficiary Celine Auma with her 5 children OVCs are shown here, with Rachel Bollinger, MFT-C, Director of Mental Health Services (front left), Rob Bollinger, NR Founder and President (front middle), and Rev. Nick Bollinger , Director of Spiritual Development (front right), Rev. Samuel Oketch, NCO Coordinator (far left), plus the entire group of volunteers that came out to help that day. 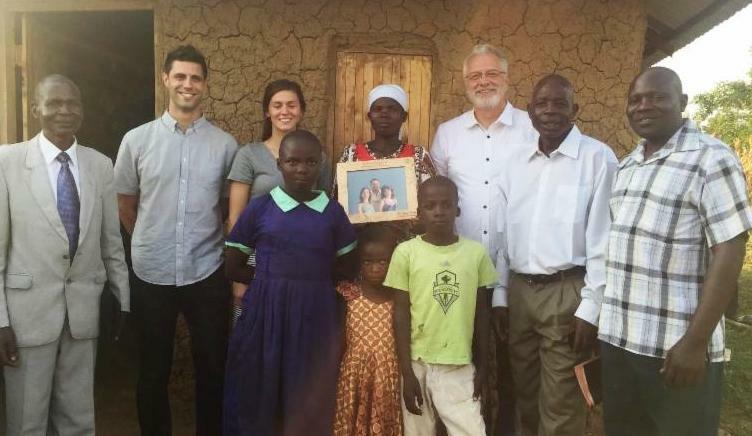 This home will provide proper shelter for Celine and her children for the rest of their lives. She will place the final two coats of mud on the interior and exterior of the home herself to prevent it from weather deterioration. The final coat of mud will include cow dung to create a plaster like exterior surface. Many blessings to Celine and her children in the future! 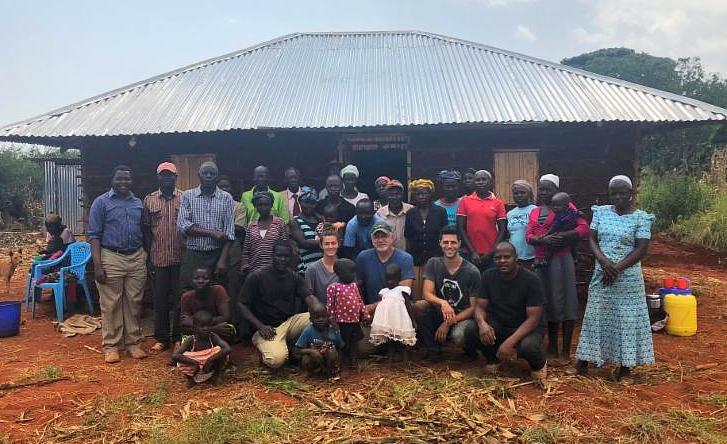 If you'd like to learn more about our program in Kenya or help support our efforts you can click on the "Give" button below.